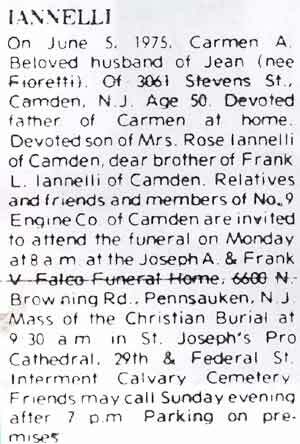 Carmen Iannelli was born in Camden on November 7, 1924 to Frank and Rose Iannelli, both of whom were born in Italy. In 1924 the family lived at 310 Berkley Street in South Camden. Frank Iannelli was then working as a laborer. By April of 1930 he had joined the Camden Fire Department. 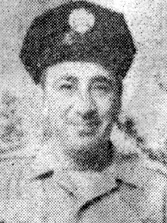 Frank Iannelli, died on active duty as a member of Engine Company 9 on April 5, 1942. 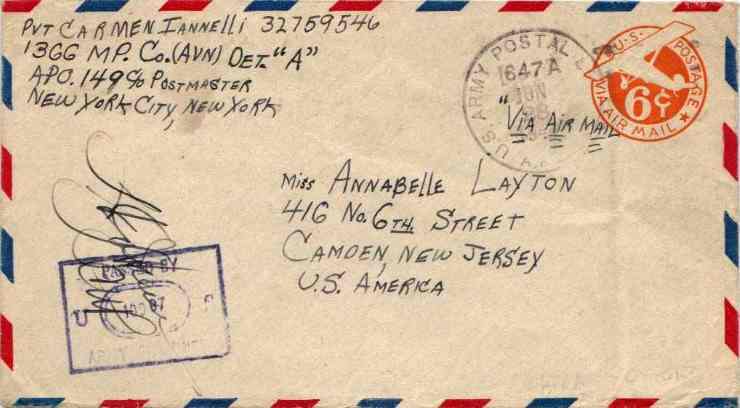 Carmen Iannelli served with the United States Army during World War II. 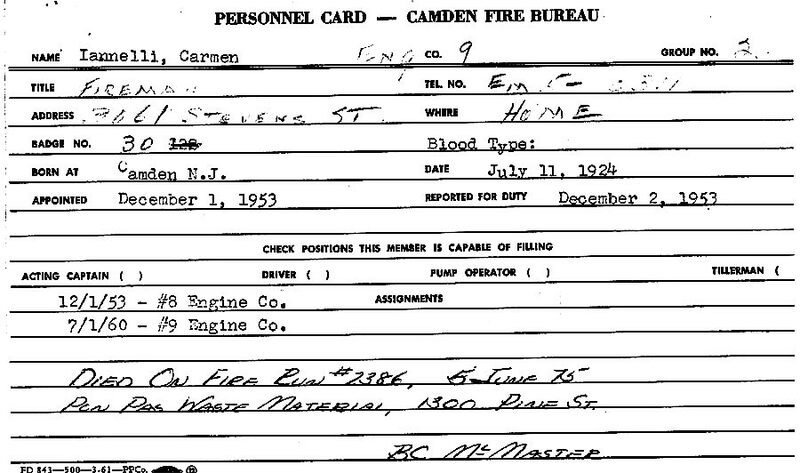 He joined the Camden Fire Department around 1953. Carmen Iannelli was still living at 310 Berkley Street as late as October of 1959. By this time his brother Leonard had moved to 3055 Stevens Street in East Camden. Tragedy again struck when his brother, Captain Leonard Iannelli, died while fighting a fire at Broadway and Chestnut Street on January 14th, 1964. 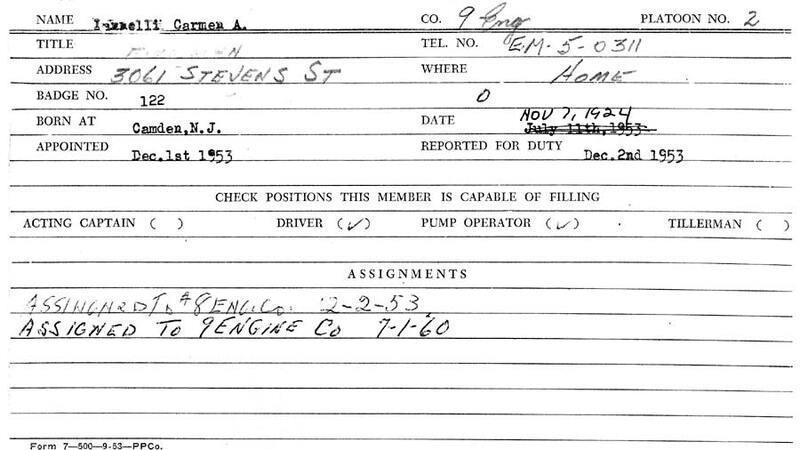 Assigned to Engine Company 9 in East Camden, by the mid 1960s Carmen Iannelli lived with his wife Jean and son Carmen Jr. at 3061 Stevens Street, near Woodrow Wilson High School. Like his father and older brother, Carmen Iannelli died in the line of duty as a Camden fire fighter. On January 5th, 1975, during the aftermath of a third alarm fire, Engine Company 9 was cleaning hose and restoring equipment at their quarters in East Camden at Federal and North 27th Street. While stretching line at the rear of the apparatus, Fire Fighter Iannelli suffered a massive heart attack, which took his life. Carmen Iannelli was the twenty-third member of the Camden Fire Department to make the Supreme Sacrifice in the line of duty while protecting the City of Camden. Carmen Iannelli was a member of Local 788, International Association of Fire Fighters, and of St. Joseph's Pro-Cathedral on Federal Street ant 29th Street in East Camden. He was survived by his mother, wife, son, and a brother, Frank L. Iannelli. A Camden fireman collapsed and died of an apparent heart attack early today after returning from the scene of a two-alarm fire that severely damaged a city warehouse. A brother of the fireman died under similar circumstances at a fire scene in 1964. Carmen Iannelli, 50, of 3061 Stevens Street, Camden, collapsed at No. 9 Engine Company headquarters at 27th and Federal Streets and was dead on arrival at Cooper Medical Center. Camden, at 2:50 a.m.
A 22-year veteran of the Camden Fire Department, Iannelli had been on the scene of a fire at the Pompas waste paper warehouse at 1300 Pine Street. According to Battalion Fire Chief Robert Dukes, the fire broke out at 7:45 pm. and burned out of control until shortly before 10 p.m. There were no injuries at the scene, Dukes said, and the fire is under investigation by the Camden City Fire Marshal's office. A hospital spokesmen said Iannelli died of an apparent heart attack. 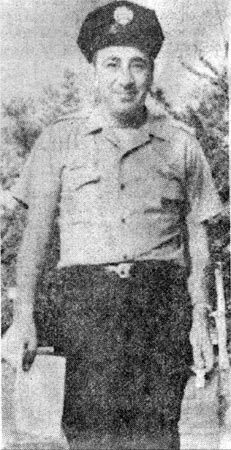 His brother Leonard Iannelli Sr. collapsed at the scene of a fire at Broadway and Chestnut Street, January 14, 1964, He was 41 years old at the time. FRANK IANNELLI came to this country in 1904 from the sleepy little mountain village of San Bartolomeo, Italy. He settled first in Boston with friends and went straight to work as a helper at construction sites. He was 13 years old. A few years later he moved to Camden, where he worked at a number of jobs before joining the Army to fight in World War I. He came back to Camden after the war and in 1921 he had himself a very good year, the kind of year that marks a turning point in a man's life. First he landed a job as a hoseman with the Camden Fire Department, a job that would keep him working during the Depression. Then he met Rosina Carlone, who, as fate would have it, was also a native of San Bartolomeo. Rose, as she was called, had only recently come to America and was living in Newark. When word reached Frank through the grapevine that a young girl from his village was living only a few hours away, he made arrangements to meet her so that he might learn the latest news about his family and friends back in the old country. Hoping to make a good impression, he made it a point to call on Rose in his fireman's uniform. The visit went very well. So well, in fact, that six months later Frank Iannelli and Rosina Carlone were married. They moved into a rowhouse at 3rd and Berkeley streets in Camden, and in short order two sons, Leonard and Carmen, were born. Years later, in 1937, a third son, Frankie, arrived. Like most Italian-American families, the Iannellis were very close. Rose would often take the boys down to the firehouse to see their father. Then, on an April night in 1942, tragedy struck. 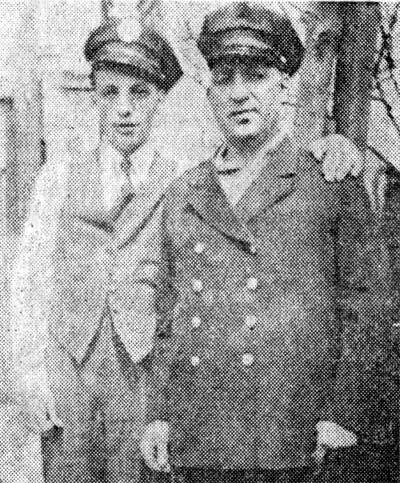 After fighting a dump fire in the city, Frank Iannelli collapsed in the firehouse at 27th and Federal streets and died of a heart attack. It happened as he was climbing the firehouse stairs. He was 51 years old. TRAGEDY spares no family. Sooner or later all of us will have to pick up a telephone in the middle of the night. 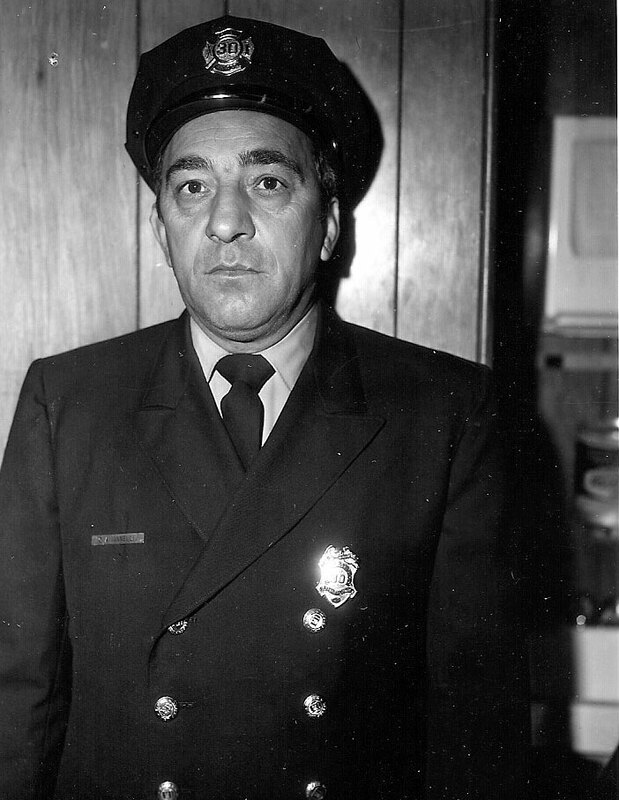 The death of Frank Iannelli hit Rose and the boys hard, but the family closed ranks around Leonard, who followed in his fathez:'s footsteps by joining the fire department in 1948. Five years later Carmen followed suit. 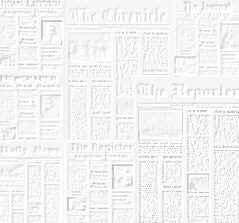 It was not until a bitterly cold night in January 1964, a night on which the temperature dropped to one degree above zero, that the Iannelli family began to think that fate had singled them out for more than their share of heartache. On that night, Leonard, 41 years old and by then a captain in the department, toppled smoke inhalation.over in the ice and snow at a two-alarm fire in a men's clothing store at Broadway and Chestnut Street. He died before he reached the hospital, of heart failure brought on by smoke inhalation. THE IRONY of Leonard's death left the family shattered and bewildered. The pain was keener because neither Leonard nor his father had a history of heart trouble. They had been strong vibrant men, full of life. In neither case was there a warning, a hint of danger. Their deaths were the hardest kind to accept - totally unexpected, as arbitrary, it seemed, as the death of someone struck by lightning. If there was a consolation for the Iannellis, it was only the thought that certainly now no greater tragedy could befall them. The worst had happened; only better days could lie ahead. Carmen was now the head of the family and the only Iannelli left in the Camden Fire Department since Frankie, unlike his father and brothers, had not been caught up by the mystique of the fireman's life and had broken with tradition by going to work for RCA. Carmen was a quiet, sensitive man who preferred to spend his idle hours around the firehouse working crossword puzzles and solving riddles rather than taking part in the practical jokes and locker room humor for which firemen are notorious. He was broad-shouldered and balding, with a homely but honest face, and as he approached 50 the resemblance to his father became almost uncanny. To his wife, Jean, and the rest of the family, he did not appear to brood about what had happened to his father and brother, nor did he seem to worry about falling victim to a similar fate. But there were times at the firehouse at 27th and Federal, where he had been stationed since shortly after his marriage in 1960, when it was clearly very much on his mind. One day, climbing the firehouse stairs with Vince Orme, who is now the city fire marshal, Carmen pointed to the second floor landing and said: "That's where it happened. That's where my father died. That's where I'll probably die too." He was wrong. He was not destined to die on the landing where his father died. He was destined to die about 50 feet away, out on the sidewalk, unravelling five-inch hose after a fire in the storage yard of a wastepaper warehouse on Pine Street. He was destined to die last Thursday, not only at the same firehouse in which his father died, but at just about the same time of day-two o'clock in the morning-and at· just about the same age - 50. THREE MEN, a father and two sons, all firemen, all killed on the job by heart attacks. The irony is almost too awful for the mind to fully grasp and comprehend. In the 100-year history of the Camden Fire Department, it has never happened before. It will probably never happen again. With Carmen's death, the grief of the surviving members of the Iannelli family can no longer be measured. It can only be sensed. It can be heard in the nervous, high-pitched voice of Frankie Iannelli, who is now 38 and who stated very matter-of­factly the other day, sitting in a car out­side the RCA buildings in Camden, that be does not expect to live much past 50 either. And it can be seen in the eyes of the widows. Terribly sad eyes, like those of children who, having been punished unfair­ly, cringe in expectation of still more punishment. In the eyes of Jean Iannelli and Leonard's widow, Olga, but most of all in the old careworn eyes of Rose Iannelli, who has lost the most, and who alone has seen the haunting tragedies of the Iannelli family unfold from their very beginnings, from the seeds sown long ago in the mountains of San Bartolomeo.